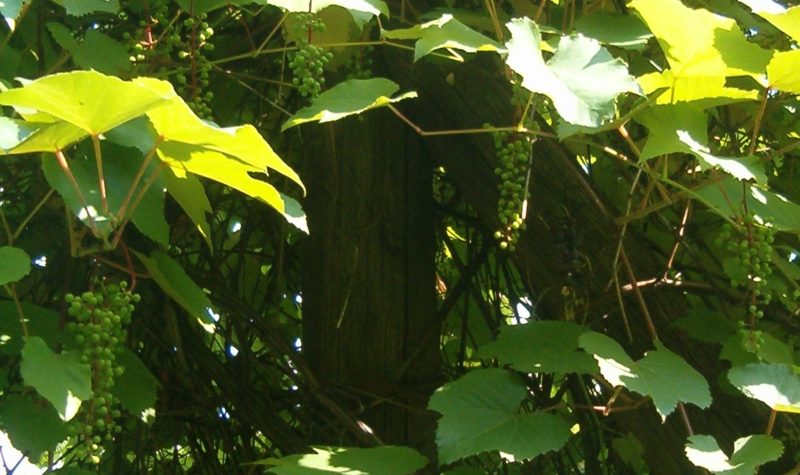 One of about 30 American species or Wild vines with complete botanical name Vitis aestivalis Michx. The name literally means "summer-fruiting vine" because it only blooms in summer - that's why it is also called the summer vine. Synonyms or old names are Vitis lincecumii, Vitis rufotomentosa and Vitis smalliana. Trivial synonyms are Blue Grape, Pigeon Grape, Summer Grape, Vigne d'Été and Uva Trepadora. It was first introduced by the French botanist André Michaux (1746-1802) in 1802 and cataloged, which is for this reason immortalized in the botanical name. The formerly run as a separate species Vitis lincecumii is very similar, their berries and the kernels are a little bit bigger. The US researcher UT Waterfall suggested in his work "Keys to the Flora of Oklahoma" that a distinction between the two species should be lifted. This has been accepted, there are now the three varieties Vitis aestivalis var. Aestivalis , Vitis aestivalis var. Bicolor Deam and Vitis aestivalis var. Lincecumii . This page was last modified at 28 June 2018 at 11:48.